When you think of pilots and sunglasses, aviator glasses probably come to mind. 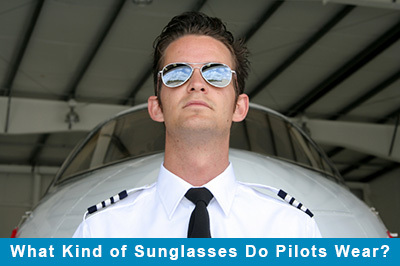 However, these aren’t the only types of sunglasses worn by pilots. Choosing the right sunglasses is important for any pilot and helps them to effectively fly their plane, protect their eyes and ensure a safe trip for all onboard. Why Do Pilots Need Sunglasses? Sunglasses are important for everyone, but especially for pilots. The atmosphere protects the earth from much of the sun’s harsh radiation. Airplanes fly in the upper levels of the Earth’s atmosphere and are exposed to much higher levels of solar radiation. Exposure to UV rays increases 5% for every 1,000 feet of altitude. Pilots need to wear sunglasses to protect their eyes from the sun, to help them effectively fly and to provide an added layer of protection should something happen to the plane. For example sunglasses might protect a pilot’s eyes from debris if a bird were to hit the windshield. Pilots don’t have to wear any specific type of sunglasses; they can choose for themselves as long as their sunglasses fit basic criteria. In general it is recommended that pilots choose sunglasses that offer 100% UV protection. Pilots can choose glass or plastic lenses and should choose tints that will help them effectively pilot. If corrective lenses are needed, it is a good idea to choose sunglasses that can accommodate this vision correction since pilots cannot wear contact lenses. Plastic lenses tend to be lighter than glass, especially if vision correction is needed. The aviator frame style is a popular frame style that is commonly associated with pilots, but in reality pilots can choose any style frame they prefer. It really is a matter of personal preference. Any frame a pilot chooses should be highly functional. Pilots must wear special headsets and communication devices and they need sunglasses that can accommodate this equipment. Sunglasses frames should also be able to be used with any needed protective breathing equipment. The equipment requirements will vary depending on the type of plane a pilot is flying. For example a fighter pilot might need different sunglasses frames than a commercial airline pilot. In general frames with larger lenses are better for pilots since they provide more UV protection than smaller lenses. Visible light and UV radiation can pass around the outer edges of lenses; larger lenses therefore provide much more protection. Frames also need to be sturdy. Pilots use their sunglasses a lot so the frame needs to be long lasting and durable. It should also fit well. Pilots need their sunglasses to remain in place even if there is slight turbulence in the plane. Once pilots choose an effective sunglasses frame, they need to devote attention to choosing their lenses. Lenses should provide high levels of UV protection (100% is preferred). The tint should be one that helps with piloting. The FAA recommends a tint of light gray with 15%-30% of light transmittance. Any sunglasses with a tint of gray, gray-green or brown will work well. Gray distorts color the least of the three choices. Pilots shouldn’t choose sunglasses with blue, amber, yellow, orange or violet tints as these can distort color and make it difficult to see instruments and navigation lights. Additionally tints that block more than 85% of light should be avoided. While polarized lenses are great for regular sunglasses, they aren’t the ideal choice for pilots. Polarized lenses can distort instrument readings. Since sunglasses are so important to the careers of pilots, this decision should be one carefully made with the help of an eye care professional. Pilots can discuss their specific needs, wants and desires and get recommendations for their preferences. If you just want glasses that look like pilot’s sunglasses, you can choose from a variety of different types and styles. What sunglasses do pilots wear? The answer is entirely up to the pilot. Pilots have a wide range of choices when it comes to sunglasses. The main requirements are lenses that will protect without distorting the vision and frames that are sturdy and large. Are you a pilot? Post in the comments the sunglasses you wear! I'm a private-pilot and I wear Gargoyle Classics with a grey/black tint. I love that they wrap around and give great coverage for peripheral vision.